The last BCS championship game debate was settled as cleanly as the two-game playoff system could manage. College football often creates more arguments than it settles, but Saturday’s conference championship gave the poll voters a relatively easy choice for the title game selection process. Florida State, the only undefeated team in the country and the team that had been the most consistently dominant over the course of the year capped their regular season with a smothering victory over Duke in the ACC championship game. Auburn, the hottest team in the country, ran down Missouri in the SEC championship game and staked their claim to the second spot. Previously unbeaten Ohio State fell behind early against Michigan State in the Big Ten championship game, rallied to take a lead, but ran out of gas in a 34-24 loss that eliminated the Buckeyes from the conversation. A year from now, a playoff selection committee will be faced with selecting and seeding a four-team field to determine the national championship. The champions of the five major conferences -– Florida State, Auburn, Michigan State, Baylor, and Stanford –- plus a short list of other worthy candidates would have spurred a fierce debate if the system were in place this season. And especially since the criteria that the committee members will favor in that process is not yet known, several plausible four-team playoff brackets have been considered and debated by columnists and fans over the past week. I’ve got a few ideas in mind myself, and of course I lean on my FEI ratings and the data and principles that produce those ratings to frame that perspective. I would not, however, advocate that any single computer system be used to select a championship field. We believe in our systems here at Football Outsiders, but these are merely tools to help understand complex data sets. I introduced Game Factors this season, the guts of the FEI ratings, opponent-adjusted single game efficiency measures and the relative weight each game receives in the FEI formula for each team. I believe that a conversation about the relative merits of national championship playoff contenders needs to consider the variable distribution of individual game performances, and Game Factors can help do that. The chart below represents the GFEI distribution for each team in the FEI top 25. For me, this is what the national championship debate looks like. What I like best about this chart is that it potentially be used to support different perspectives and priorities in evaluating each team. The chart is organized according to the FEI rankings, but it helps illuminate key characteristics of each team’s set of game performances. Which teams had the best collection of elite performances? Which teams were most consistently strong? Which teams had the best and worst losses? It also illuminates the problem of leaning on data alone to determine which teams are the best. The FEI ratings at the end of the regular season place Stanford (11-2) ahead of Florida State (13-0) ahead of Alabama (11-1) ahead of Auburn (12-1). Those four teams may be popular picks for the best four teams in the country, but few would rank them in this order. 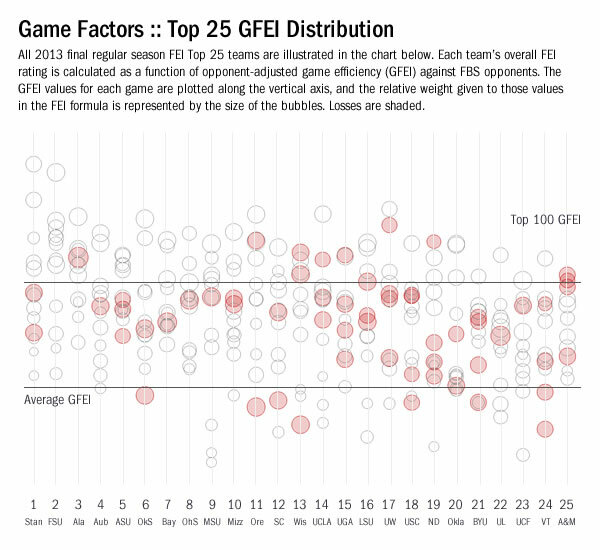 Game Factors explain why FEI ranks the teams in this order and the chart illustrates the influence of those factors. Stanford has two losses, but the Cardinal also have two of the four best single game performances of the year according to FEI. Both of those wins actually came against No. 5 Arizona State (one in September, one last weekend). ASU is the team with the least variability in performance and the team with the highest floor. The Sun Devils’ worst game rates better than the worst performances of all other teams, though every other top-20 FEI team has at least one GFEI performance ranked higher than Arizona State’s best game. Florida State has the best collection of good wins by far. The Seminoles have eight top-100 wins according to GFEI. (Alabama has seven games ranked that highly, though one was a loss. Stanford and Arizona State have five GFEI top-100 wins each. Michigan State has four. FEI doesn't think Florida State is the clear-cut best team in the country because the Seminoles haven't faced elite competition frequently enough, but if the Seminoles dominate their bowl game that would do the trick. Auburn has a head-to-head win over Alabama, but Alabama’s best game (38-17 over LSU) is better in the eyes of FEI than any of Auburn’s wins, and Alabama’s worst game (31-6 over Colorado State) is rated better than four Auburn single game performances. Alabama’s loss is better than Auburn’s loss too. It is perfectly understandable that Auburn (SEC champion, head-to-head winner over Alabama) would be selected and seeded ahead of the Crimson Tide by a playoff selection committee, but it is helpful to understand the other data that can help inform that selection process. A year ago, I wrote about how the top four FEI teams heading into the bowls were a re-ordered version of the top four in the final BCS standings, and we are in the same situation this year. I expect that the winner of the BCS championship game will vault to the top of the FEI ratings in the end, but results across all bowls will impact the system in subtle and significant ways. The Fremeau Efficiency Index (FEI) rewards playing well against good teams, win or lose, and punishes losing to poor teams more harshly than it rewards defeating poor teams. FEI is drive-based and it is specifically engineered to measure the college game. FEI is the opponent-adjusted value of Game Efficiency (GE), a measurement of the success rate of a team scoring and preventing opponent scoring throughout the non-garbage-time possessions of a game. FEI represents a team's efficiency value over average. SOS Pvs: Strength of schedule based on the likelihood of an elite team going undefeated against the given team's schedule to date. SOS Fut: Strength of schedule based on the likelihood of an elite team going undefeated against the given team's remaining schedule. FBS MW: Mean Wins, the average number of games a team with the given FEI rating would be expected to win against its entire schedule. FBS RMW: Remaining Mean Wins, the average number of games a team with the given FEI rating would be expected to win against its remaining schedule. OFEI: Offensive FEI, the opponent-adjusted efficiency of the given team's offense. STE: Special Teams Efficiency, the composite efficiency of the given team's special teams units - field goals, punt returns, kickoff returns, punts, and kickoffs. FPA: Field Position Advantage, the share of the value of total starting field position earned by each team against its opponents. These FEI ratings are a function of results of games played through December 7th. The ratings for all FBS teams can be found here. Program FEI (five-year weighted) ratings and other supplemental drive-based data can be found here. I really love that table. Would love to see one for game DVOA for NFL teams too. A really simply but illustrative way of looking at the teams. When selecting teams for a four-team playoff, why is it necessary to select the four best teams? Should not the four teams that had the best season be selected? Why try to eliminate the effects of random bad luck, for instance? In the NFL, if you win 12 games but your pythagorean wins expectation is only 8.5 wins, or DVOA says you aren't any good, you still get to win your division. If you play poorly and somehow win a few games in a row in the playoffs, you still win the superbowl. Don't have to be the best team. Just the one that had the best season. Likewise, it should be based on results and strength of schedule in college. I agree with this. But almost all objective "reward-based" rankings put Stanford in the Top 4 anyways (along with FSU, Aub, and Alabama). They played by far the toughest schedule of any elite team. If the selection committee left Stanford out of the playoff, I would be upset. They're way ahead of MSU and Baylor unless you severely over-emphasize number of losses and games against east coast teams. Why is Washington 7-4 and Washington State 5-6? As near as I can tell, the Idaho games are excluded, but Idaho is FBS. WSU played Southern Utah; U-W played Southern Idaho. It is, however, ridiculous to not penalize Oregon State for losing to Eastern Washington. You used the word 'penalize'. Is it ridiculous that the 46th ranked FBS team lost 49-46 to an 11-2 FCS opponent? I'm not sure it is reasonable to conclude which direction Oregon State would move in the rankings if I included FCS games. Eastern Washington is almost certainly worse than the 46th best team in the FBS by a considerable margin. Most predictive computer rankings put them in the Virginia/Middle Tennessee St/San Diego St range. They are not an elite FCS team this year like North Dakota St and Eastern Illinois (watch EWU win the FCS playoffs now and make me look silly for saying that). Even accounting for the first EWU loss, Oregon St would be favored in a rematch at home by about 20. So yeah, it was a big upset that isn't accounted for in your rankings. How much would Stanford be favored over Utah if they played again? My system is accounting for that upset and the Cardinal are still ranked #1. At the end of the day, the EWU loss was certainly an upset, but I really don't think I can conclude anything about what it would do to Oregon State's rating if I included it. I find all this fascinating, and provocative. I have a question that I can't seem to answer, so maybe you can help. FSU has the 90th ranked SOS according to the table above. Yet, you state that they had "the best collection of good wins by far." I am having a hard time keeping those two seemingly contradictory pieces of evidence in my head at the same time. The best I can come up with is this: FSU's opponents were garbage all year, but they way they beat them was so convincing that they become good wins.